Lord Bragg is to be presented with an Academy Fellowship by Bafta for his "outstanding and exceptional" contribution to television. Lord Bragg is best known for presenting ITV's flagship arts programme The South Bank Show, which began in 1978. TV committee chair John Willis said Lord Bragg's "commitment to the arts has shone through in over three decades of quality programme-making". Last year, ITV announced that The South Bank Show was coming to an end. 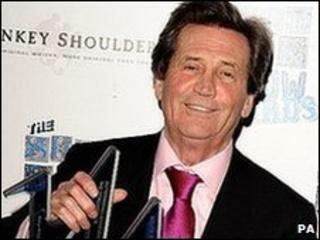 Lord Bragg, 70, will be presented with his award at Sunday night's Bafta TV awards at the London Palladium. "I have been lucky enough to devote my life to my main passion so to be awarded for this is even more astounding," he said. "The list of past recipients highlights what an incredible accolade this is." Last year's recipients were Dawn French and Jennifer Saunders while other recent fellows include Richard Curtis, Sir David Jason and Bruce Forsyth. Receiving a special honour at the last ever South Bank Show Awards in January, Lord Bragg said he was "baffled" by ITV's decision to axe the show. Prince Charles, speaking in a taped testimonial shown at the awards, said it was "a sad loss". ITV recently broadcast a series of South Bank Show Revisited programmes in which Bragg met up again with high-profile previous subjects including Victoria Wood and Lord Lloyd-Webber. The Bafta TV awards, hosted by Graham Norton, will be broadcast at 2000 BST on Sunday 6 June on BBC One.